We promised we would rarely bother you, but since we have never really updated you all, nor formally thanked each of you for your contributions, we thought that it was a good time to start. In addition, we also got our email database programmed and it was finally made possible to do this mass mailout - it is nice to have a programmer involved with HANA (thanks to HANA president Jeff Platt!). As always, we hate any type of spam and we are a player driven organization. If you do not want to receive the HANAnewsletter, please click remove in a link provided at the end. 1. There are 428 of us, as of December 8th. 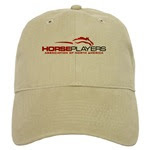 You represent horse bettors, horse owners, horse trainers and fans. We have a very nice mix so far that we are proud of. Not all of you filled out handle information, but for those that did: We have about 45 everyday larger players (100k bet per year or more). We have about 89 smaller players (10k per year bet or less). The rest fall in the middle. Our largest documented player is several million bet per annum. Our smallest is $200 per annum. We're happy to have all of you. If you have not told a friend about HANA, send them this easy link if you do not mind. It heads straight to the sign up page. It has been an excellent period of growth. We have grown each month more than the last. It is catching fire. 2. We are Incorporated! This was achieved in September. 3. We have an Advisory board and are proud of those who chose to lend a hand. Barry Meadow & Nick Mordin followed original members Cary Fotias & Dr. William Ziemba (Dr. Z for short!). There are full bio's under the hyperlinks above. Anyone have a suggestion on new board members? 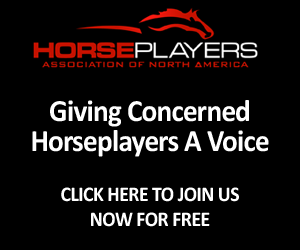 We'd love to hear from you at horseplayersassociation@gmail.com. 4. We built a Website. It is free to us (so far) as our web hosting has been donated, and we are adding to it each week. Although regular updates happen on HANAblog, it is nice to have a spot in cyberspace for us to make available. We were stoked to have Hajck Hillstrom write for the HANAblog. Hajck is a member of the Horseplayers Hall of Fame, and a horse owner too. He is currently writing a series on the blog about "Why he Left Racing". If you have not read it, give it a try. You can read part's one two ,three and four here. Next up for Hajck? HANALive! It is a look at live racing and what makes it great; and not so great. HANA president Jeff Platt worked the phones very hard with the ADW dispute. He has been interviewed by Bloodhorse, and has spoken to Jack Liebau from Youbet, Drew Couto from the TOC/THG and come to his own conclusions too. You can read his series at HANAweb under "articles". Horseplayers are unique. We tend to walk to the beat of a different drummer. Because that's who we are, we have created a couple of things that members might be interested in. First up, our HANA store is here. 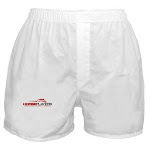 Hats, shirts, and despite the protestations of Treasurer Theresia Muller..... boxer shorts! We are not designers and we are working on pretty much a zero budget and our own dime; don't expect the world, but if you choose to support the Store by buying a tee shirt, be sure of one thing - the cash will be used for HANA. Secondly, We are currently in the design stage for a state of the art, Official HANA Member Lapel Pin. These pins are not for sale on the website to the general public, nor will they ever be. They are only available for charter members of HANA. They will be gold (in color, not real gold; we ain't Jess Jackson), with our fine logo and a charter member insignia. These will be made for purchase and we think this will be the only revenue that HANA will achieve in a measurable way. As we stated in our Mission Statement: We will never ask for membership fees, ever. We feel that the tracks have taken far too much advantage of us by expecting us to play racing at all costs. We do not have this philosophy and believe it hypocritical if we did. Any revenue we ever ask for will be voluntary. If you would like to buy a pin ($20) please email us at horseplayersassociation@gmail.com, or simply reply to this email. HANAnote: We would certainly like to take credit for the pin idea, but like most organizations, the grass roots know better than the ones bogged down with business - HANA member Ernie C is the idea man on this one. Thanks Ernie. We have our Paypal account set up. To donate, please click here. To everyone who donated..... a sincere thank you. We actually have a bank account now! HANA is on Facebook. We need friends! I am sure the tracks won't add us so if you are on there, please become a fan. We need all the help we can get (a common theme, I know). We have had some well-followed posts at HANAblog. We update it almost daily with player and industry news (with some handicapping mixed in too!). Here are some of our more heavily linked and trafficked pieces. 2.0 - Ever wonder how racing on the internet is doing compared to other sports and games? The Future Looked Bright: In 2000 we bet around $14.2 billion dollars. In 2008 we will probably bet less than 14.2 billion dollars. We Need a Takeout Reduction: Racing execs have shifted their mentality. And the result: In the 60's and 70's racetracks were hesitant to even bring in exotics because they were worried that fans would lose money too fast and be discouraged. Jeff Platt at Bloodhorse: "You don't walk into a casino and have someone tell you the craps tables are closed, or the blackjack dealers are on strike," Platt said. 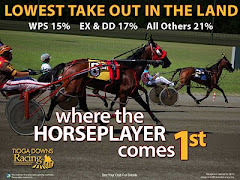 Low Takeouts Grow Racing (featured by Nick Kling of the Troy record and in Trot Magazine in Canada): After 150 days of playing, this is the result: The track exec coached player is almost broke – he has around $2 left. He has bet in total, around $24,000. Our player, with that small rebate, bet over $330,000 in those same 150 days of betting. We Need More Information: Vet Records : In Hong Kong they truly take their sport seriously and they take bettors seriously. After each sub par performance, the horse is checked and this information is made public so the bettors can be confident and know what happened. Declaration of Horseplayer Independence (Cary Fotias) :When in the course of thoroughbred events, it becomes necessary for horseplayers to dissolve the financial bands which have connected them to insensitive racetrack owners and short-sighted state legislatures, and to assume among the powers of the earth, the rightful station to which they are entitled, they should declare the causes which impel them to action. How About Uniform Payout Standards in Racing? : Track payouts are just another example to show how disconnected the racing jurisdictions are to each other. How do we expect universal drug laws from an industry that can't even set payout standards? There is much more at HANAblog - the home for HANA, where horseplayers just like you are taking on the issues important to us. Want to guest blog? Do not be shy. We want to hear from members. 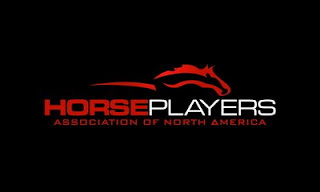 Send us an email at horseplayersassociation@gmail.com and let us know what you want to post! Post questions and comments if you wish to any and all pieces. We sincerely want to know what you think. We don't have much cash, and we are not Andy Beyer on a TV screen or the Washington Post. To grow we need our members to help us grow. What can you do? Many things. If each one of you forwarded this newsletter to a friend who is not yet a member and they sign up, we could double the membership. Maybe you go to the track live? How about mentioning HANA to five players between races? They can find us by doing a google search. Maybe you are on Facebook or Myspace? If so, add us as a friend and ask your friends to do the same. There is a great deal we can do if we all pull together. When this started it was a big question mark. Would we fall on our face? Would we be able to assemble a group of people that would put aside work and kids and the encumbrances of everyday life and stick with it? Would we be able to ever sit down and chat and get the nasty details taken care of like a bank account and incorporation and weekly meetings? 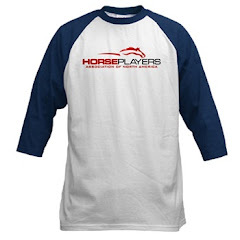 Would horseplayers actually sign up? We are happy to say that we have been able to succeed at this early stage, thanks to you all. And a special note to those early on who worked hard for HANA, but every day life has them in less of a role now: CJ, Raleigh, Maury, Indy, Andy, Ray and Andrew. I hope we did not forget anyone. On our blog we saw a comment from Mike Maloney, a player who sits on many panels as well as many others in the sport that we'd all know. We have sign ups and comments from trainers. We heard from small players and big players. When Jeff asked Ken Massa of HTR and Dave Schwartz of HSH to post a helper for sign ups on their site they simply said "sure" and helped the cause. 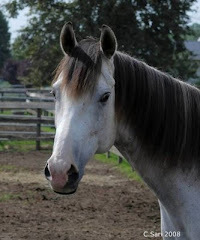 We have been linked on various blogs, were invited to be a part of the Thoroughbred Bloggers Alliance, have been linked at Equidaily, made the front page at Harnesslink.com, wrote pieces for the Paulick Report and had a comment or two at Bloodhorse. All in four months! We are forgetting so many people that have helped. There are too many to mention. But we say thanks to all. We ask again for more: If you know anyone who wants to join, or help, send them to our sign up page. If you know a horseplayer who might want to read a bit about what we are up to, please forward this email to them. Anything and everything you can do to help is appreciated. We will see you back in the New Year with volume two of this newsletter. Thanks to everyone, and good luck at the windows. PS: A sincere best wishes to everyone for the Holiday season. If you feel like doing something nice for the horses, HANAblog has linked several retirement foundations for our four legged friends. A few of us have donated to these causes. It makes you feel good. Again, Happy Holidays and thanks for supporting HANA. When in the course of racing events, it becomes necessary for horseplayers to dissolve the financial bands which have connected them to insensitive racetrack owners and short-sighted state legislatures, and to assume among the powers of the earth, the rightful station to which they are entitled, they should declare the causes which impel them to action. We hold these truths to be self-evident, that all horseplayers are endowed with certain unalienable rights, that among these are market-driven takeout rates, sterner drug policies, the integrity of the wagering pools and the embracing of new technologies that could make it easy to bet on any race, anywhere, at anytime.